Your task just keeps getting harder if you’re actively shopping for one of the increasingly popular subcompact crossover-SUVs. Now there’s a Hyundai to consider, the Kona. Even this South Korean mini-ute doesn’t get to soak up all the new-kid-on-the-block attention for itself. The hot category also welcomes the Ford EcoSport, Nissan Kicks, and Toyota C-HR to the fold in 2018, so dedicated comparison shoppers will have their hands full. 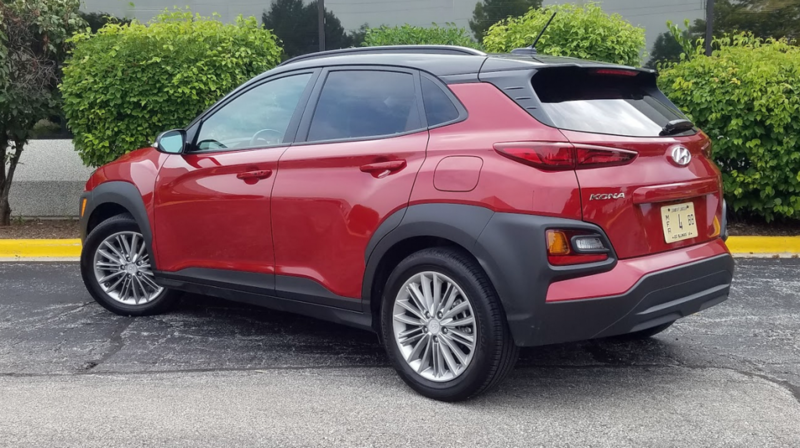 When they stop by the Hyundai showroom, they’ll find four trim levels—each with a choice of front- or all-wheel drive—and two engine/transmission pairings to consider. Even in entry SEL trim, Kona looks well outfitted. Among the standard features are 17-inch alloy wheels. 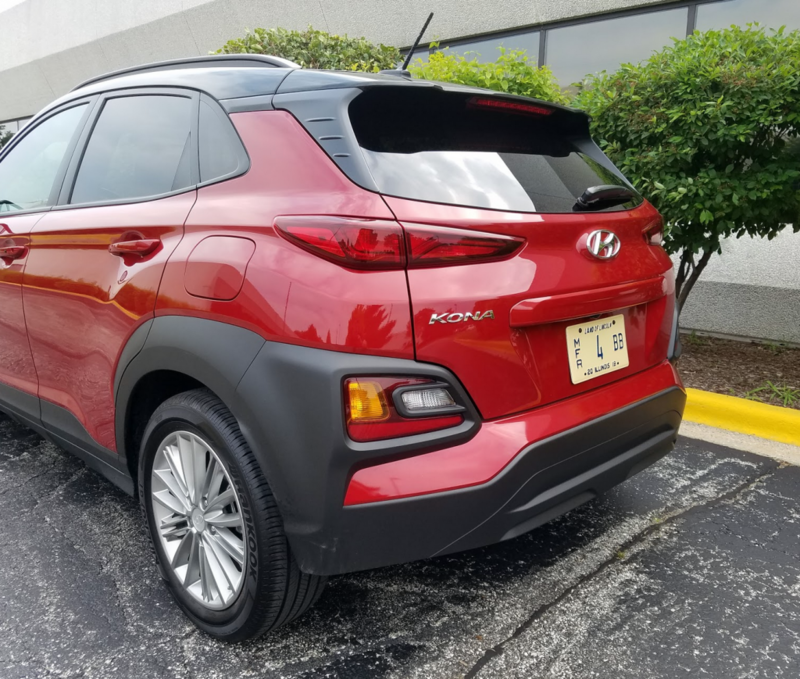 Consumer Guide tested a front-drive Kona SEL, Pulse Red with a black contrast roof, which started at $22,280 with delivery. (Doing without the special roof treatment lowers the price by $150; selecting AWD adds $1300.) Like the entry-level SE, the step-up SEL uses the tamer of the two engines and a 6-speed automatic transmission. The list of other notable standard equipment reads like this: 17-inch alloy wheels, side roof rails, heated exterior mirrors, heated front seats, leather-wrapped tilt/telescoping steering wheel, manual air conditioning, cargo cover, satellite radio, and keyless access and starting. Driving aids and tech features are downhill brake control, rearview camera with dynamic guidelines, individual tire-pressure monitoring system, 7-inch touchscreen, Bluetooth connectivity, Apple CarPlay/Android Auto compatibility, and blind-spot and rear cross-traffic alerts. Cabin materials are largely budget grade, but the Kona cabin is otherwise comfortable and surprisingly spacious. 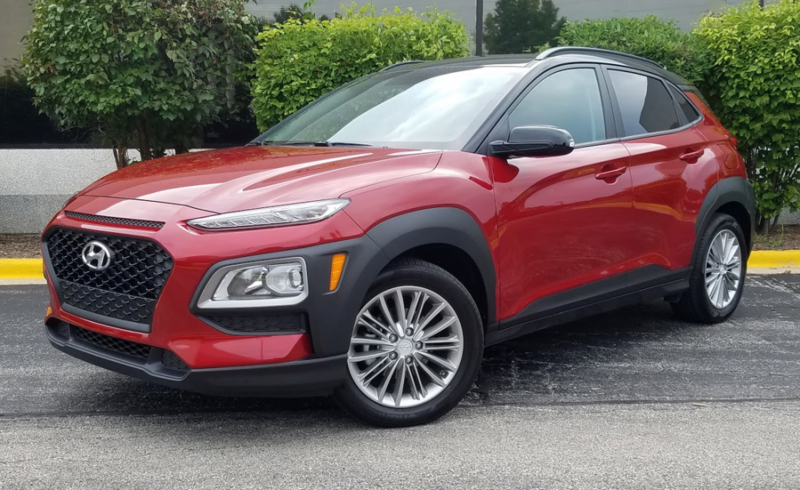 Kona customers willing to spend for a leather-upholstered Limited or Ultimate will get a 175-horsepower turbocharged engine and 7-speed automated-manual transmission that gives the new Hyundai a leg up on a number of entries in the class. The SE/SEL powerplant is a naturally aspirated 2.0-liter 4-cylinder with gas-saving Atkinson-cycle induction. At 147 horsepower and 132 lb-ft of torque, it’s competitive within the segment. Performance is adequate for passing or merging into expressway traffic, all the more so with “Sport” mode activated for a shift profile that’s a little bit different. Standing-start performance isn’t as lively—even being in Sport just brings lots of noisy revving during the wait for a true sensation of acceleration. The front-drive SEL has EPA fuel-economy ratings of 27 mpg in the city, 33 mpg on the highway, and 30 combined. This reviewer averaged 26.7 mpg in his 162-mile test drive that involved 60 percent city-style operation. Kona offers about as much cargo space as other vehicles in the Subcompact Crossover class. The second-row seatbacks fold nearly flat with the load floor, creating a usefully long storage area. CG’s test vehicle handled easily and was quite maneuverable, thanks in part to exterior dimensions that are tidy even for the segment. Sport mode makes a minimal effect on steering response that runs from loose on center to somewhat heavy deeper in its arc. As for ride, it takes a pretty nasty surface crack to truly upset the Kona. Passengers will find no real crowding in the front row, with good head- and legroom. Between the tilt steering wheel and manual seat-height adjuster, this driver was able to find just the right driving position. Headroom is generous in back, too, but legroom is tighter—especially if the passenger ahead tracks back all the way—and tight footroom can make exits somewhat difficult. The adult population of Rearseatville is two. Compared to many other subcompact and compact SUVs with “sporty” rooflines, visibility is pretty good even to the rear corners. Currently available only on SEL models, the Kona Contrast Roof option pairs Pulse Red, Sonic Silver, or Surf Blue bodies with black roofs for the not unreasonable price of $150. Padded, soft-touch surfaces are in short supply on any Kona below the Ultimate level. The only such area in the tested SEL was the armrest lid to the console storage box. However there was a pleasing look and feel to the seat fabrics, which included a hound’s tooth pattern down the middle. Driver-oriented gauges, including a 3.5-inch central information display, show up well, and ancillary control buttons on the dash and steering wheel are easy to reach and work. Function buttons flanks the touchscreen, but once activated, these systems are simply controlled on the screen. Tuning and inputting audio presets is easy as can be. The climate controls consist of three dials: temperature, fan speed, and mode. Clearly marked buttons to activate seat heaters and incline-braking are on the console around the shifter. Cabin storage starts with a glove box that’s pretty big—but so is the stack of manuals that fills it up. The squarish console box cedes a corner of its modest space to a quarter-round cover that gives clearance to the parking brake. Ahead of the console is a large open bin with auxiliary and USB inputs. A net pouch is attached to back of each front seat. All four doors have map pockets, though the ones in back are pretty small. There are dual cup holders in the console and in the pull-down center armrest in the back seat. The main cargo area behind the rear seats is hardly capacious, though this is a problem that afflicts other subcompact crossovers. At least it loads at bumper level with no lip over which cargo has to be lifted, and there’s some small-item storage in a partitioned foam organizer under the floor. A pocket to hold incidentals is provided in the right sidewall. For bigger hauling needs, the 60/40 split-folding rear seats drop almost flat and enjoy a smooth transition from the load floor. Aggressive, tough styling; moderately engaging driving behavior; a good start on features (with more available in the Tech Package option); and a competitive price make the Kona SEL a worthy entry in the budget SUV field. It’s just one more thing to think about. With an as-equipped price under $23,000, the nicely outfitted Kona SEL strikes the Consumer Guide staff as an especially strong value. Written by: The Daily Drive staff on August 22, 2018.